There was a Drumming Workshop held jointly with Milton School, organised by the STG, at the Secondary School building on Scoraig on 13th June. Pupils helped with the catering. ·had lunch in the marquees. We all made new friends. As the drumming started we all laughed. We enjoyed it and would like to see Steve the drumming man again. We played so many games it made my fingers tingle. We were happy. It was fun. I was a bear in an African game. We learnt how to make pizza. We used cheese and onions. It was very yummy. We played so hard so hard our hands nearly fell off. The drums were African drums made of the skins of animals. The drumming was fun. They were small compared to a table. Some were big compared to a chair. I felt happy. Thank·you to Milton School for coming. Many thanks, from all at Scoraig School, to everyone who supported Drum Fun event, and to everyone who has given their support to the school this year. Lael Forest Community Hydro – Ballot Result! Ullapool Community Trust is delighted to announce that lots of local voters took part in the recent Lael Forest Community Hydro ballot and that a huge proportion of people voted in favour of the proposal. All of the Trust’s directors and staff would like to thank everyone for their interest, question, involvement and votes! The ballot was sent to the 1738 voters living between Gruinard and Elphin and was returned by 1010 people which equates to a response rate of 58.11%. Of the returns 96.53% voted in favour of the proposals from UCT for hydro schemes at Lael Forest. As the ballot has shown strong local support for the Lael Forest Community Hydro project UCT will now work on a National Forest Land Scheme application to lodge with the Forestry Commission Scotland (FCS). Since the burns are on FCS land the application is required and must be approved before more feasibility work can be carried out. A successful application will also allow the community to develop the projects if local people continue to support the proposal once more investigation work is completed. The National Forest Land Scheme application will be lodged with the FCS this autumn and UCT will keep the community updated on progress over the coming weeks and months. At this stage UCT are keen to establish a team to help progress the project. If you would be interested in being part of the team or want to find out more about what would be involved please contact the Trust’s Local Development Officer Ewan Young or a UCT directors. Contact details available here. More info on the Lael Forest Community Hydro project is also available. See this link for the new web site with lots of info for anyone interested in renting Tom’s bothy at Achmore. See the Map link above for location of this and other places on Scoraig. 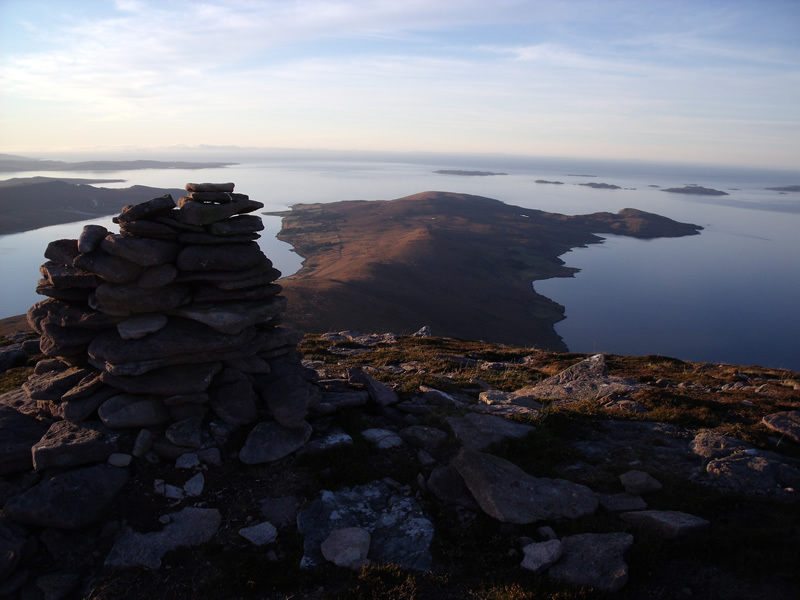 There is a gallery of photos around Scoraig on the site too. It is good to be back. The children have been busy bees and the garden and classroom are looking lovely. IEP’s ,for some pupils, pupils will be sent out next week and, as always, you will be invited to come in to school and discuss these with me. I am happy to answer any questions that you may have. Margaret Beaton, Hostel Provision, is hoping to come out on Tuesday 18th June. You are invited to come along and meet with her. Details to follow. Thursday 13th June– Drumming event. This will be lots of noise and lots of fun. It will take place in the Secondary building and some pupils and staff from Milton school are coming over to join us. We look forward to meeting them. Many thanks to all who organised and funded this event. Wednesday 19th June- A Parent Council meeting has been arranged for this date at 4 p.m. in the Primary School building. All welcome to attend. Please let Joany know of any items for the agenda, in advance so that she can send out the agenda prior to the meeting. I am happy to discuss the timetable and look at resources as requested. The Feis ladies will be returning to Scoraig to do a whole day of music on 25th or 26 th June. Cinema nights will resume when the nights get darker ! The board is not good unless it is dark. In the meantime enjoy spring and summer. Hopefully the sun will shine. We will be sorry to say goodbye to Alex at the end of this term. She is a valued member of the school and we will all miss her. We wish her well at Ullapool and are sure that she will meet lots of new friends. Many thanks to Susan for organising the recent Scottish Ambulance visit for pupils. It was very worthwhile and we learned a lot. The children also got a chance to use the Annie dummy. They gave sensible answers and did all of the practical activities very well, showing that they had listened. The ladies were very impressed. Thanks to Bill for ferrying us across the water to our swimming lessons and to all in the STG who gave funding which allowed us to pay for the bus journeys this year. Sharing with Badcaul was a successful transition event as the children got to know one another more. Thanks to all who helped at the wind turbine workshop lunches and who donated money to the school to pay for the drumming. This will be a spectacular event and we are all looking forward to it. Thank you to Martha for doing a great job of transforming our garden. In line with the curriculum for excellence the children are doing active learning and lifelong skills. We hope to have enough vegetables for a good pot of soup ! Do not hesitate to contact me if you wish to discuss anything. Home Grown Produce, Home spun and naturally dyed wools, Tweeds, Drawings, Photographs, Felts and lots of skilfully made arts and crafts. Open 12:00 – 4:00 Serving tea, coffee, soup and filled rolls and home baking. or walk in along the loch side. A great day out exploring this remote and peaceful peninsula.